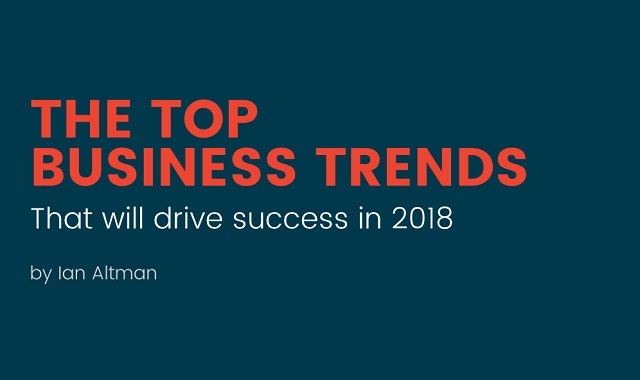 Top Business Trends for 2018 #infographic ~ Visualistan '+g+"
With 2017 coming to a close, the holidays, and our looming New Years resolutions, it’s easy to lose focus. Here’s how to set yourself up for professional success in the new year. While it’s impossible to say what the future holds, we can still make predictions. The business landscape for 2018 is a wide one - from AI to social media to blockchain. In 2018 artificial intelligence will drive customer experience. We will see more and more companies embracing AI and what it can do for them. Social media will begin to take a back seat when it comes to customer interaction. Smart companies know that social media doesn’t replace real-life interactions, but can make the time we spend face-to-face with others even more valuable. Ready to drive your own success for 2018? Take a look at this infographic for more on which business trends to keep an eye on in the coming year and how you can use them to your advantage.